Browse: Home / WAKEY WAKEY! Wake Up! gatherings, where people are given opportunity to use a quality PA on the streets of towns and cities to discuss politics, are mushrooming over the country. Debates which often only take place in limited circles and leave us divided and easier to rule – encompassing racism, religion, sexism, and austerity – are taking place openly in the street and helping build solidarity amongst the working class. The views of the right wingers and the racists are openly being challenged out of doors without the use of darkened meeting rooms and the need to read in advance. Equipment is provided by Community Bandstand and, during sessions, no-one is allowed to outshout another speaker, ensuring a degree of voice for all involved. The first Wake Up! Manchester followed on from some arrests in the summer of 2014 at the anti-fracking site at Barton Moss. PA equipment was used outside the police station where the arrestees were held and quality debates began. Initially, the Wake Up! sessions were musical, with serial monologues but they soon developed into debates. 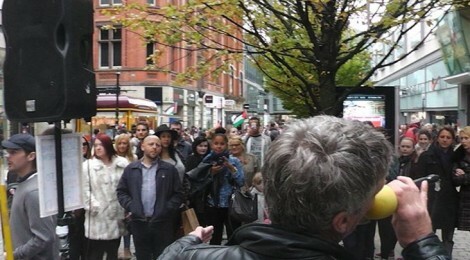 Recently in Manchester, a rabid Christian using his own PA was peddling his church on Market Street. He was challenged, using another street microphone, with people asking “What happens to all the money you collect?”. A large crowd got involved in the debate which challenged the power of the church and the role money plays in sustaining it while the poor and homeless remain on the street. In Bolton, an EDL member was mouthing off their usual Islamophobia. A large crowd gathered and the racist ideas were dismantled before the racist skulked off. Collective activity was able to overcome racist ideas where they would have went unchallenged much of the time. It can be dangerous to give any sort of voice to the likes of the EDL or the religious right, however the Wake Up! team believe that it is sometimes effective to break down their ideas openly in order to marginalise their opinions. This can also be used to show those who would otherwise be terrorised by an oppressive fringe that popular support stands against the racists and bigots. For some people, access to new anarchist ideas is limited by unease with reading or a limited literacy. Wake Up! gets around this by allowing for street debate. When you have a conversation with a person you have an opportunity to clear up misunderstandings there and then. Currently Wake Up! Operates in Bolton, Manchester, Liverpool and Wigan. New Wake Up! groups are developing in Ipswich, Newcastle, Bangor and Sheffield. Advice on setting up a Wake Up! Choose a space with good footfall, room for PA equipment, and space for a banner behind e.g. outside a closed-down shop with shutters. Pick a regular time so people can find you. Check local by-laws. In some areas, when challenged by the law, cops left when informed it was a civil issue and the council were welcome to come and discuss it with them. This may be different in your area.